For effective biological control of common agricultural pests. A wettable powder concentrate of Beauveria bassiana registered for the control of Red Spider Mites and Whitefly, Eco-Bb is ideal for use as a standalone pest control product or as part of an Integrated Pest Management program. During the formulation process of Eco-Bb®, carrier molecules are used to which spores adhere. These molecules are encapsulated in an oil droplet resulting in the formation of a colony forming unit (CFU). Each gram of Eco-Bb® product contains 2 x 109 CFU and each CFU contains 3 or more spores. This is very important because when the CFU adheres to the target organism’s cuticle, the concentration of enzymes secreted when the spores germinate is much higher compared with single spores germinating after application on the target pest. The result is improved efficiency due to increased penetration and degradation of the cuticle. Ability to reduce any of the life cycle stages of the target organism. Superior wettable micro-granule oil formulation. Non-toxic, completely natural and has non-withholding period. 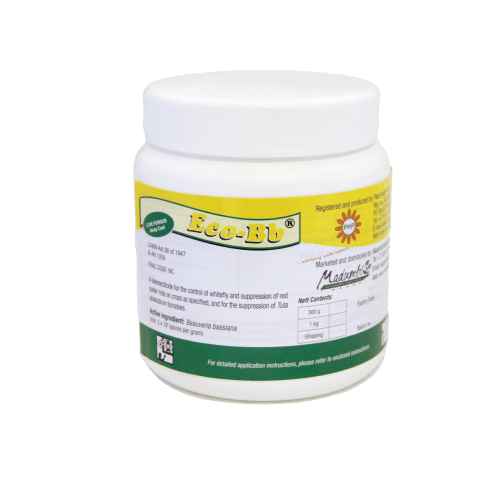 Eco-Bb® is effective against the egg, larvae/nymph, pupa and adult stage. Therefore, the opportunity to reduce or impact on the target population is excellent. Inclusion in an integrated pest management (IPM) strategy will result in a more effective program overall. 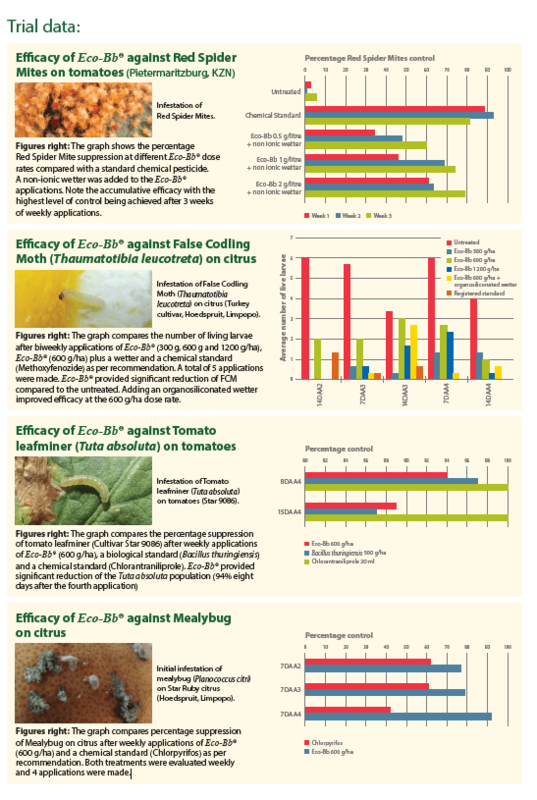 Eco-Bb® has the ability to suppress and manage a wide range of target insect pests. Mode of action of b. bassiana is different from chemical insecticides, making Eco-Bb ideal to use in IPM and resistance management programs. Spores are encapsulated in a dry oil formulation which prevents the fungal spores from drying out and becoming deactivated under field conditions. The strain was isolated in Clanwilliam, South Africa and is adapted to hot, dry, semi-desert conditions. Eco-bb is suitable for organic and conventional agriculture and can be applied during the harvesting period. The active ingredient in Eco-Bb® is spores of the fungus Beauveria bassiana, an entomopathogen, which occurs naturally in soils throughout the world. Once the spores come into contact with the cuticle (skin) of the target organism, they germinate; secreting enzymes which specifically weaken the insect cuticle. The fungus invades the host directly and once inside the target organism, the fungus continues to grow, feeding on the internal organs. When the target organism dies, the fungus takes over the cadaver and, in favourable conditions, grows back out through the body wall, sporulating on the surface. The dead organism is then enveloped in a mat of white conidia (a fruiting body containing spores).